Being able to go out and pick your own berries is a summertime treat. Berries not only taste good, but also have important nutrients for a healthy diet such as vitamin C and anti-oxidants. Preparing most berries for eating is as simple as rinsing them under running water. Berries are used in many dishes and foods such as desserts, cereals, yogurt, breads, cakes, smoothies, cookies and ice cream, even wine! They can be frozen to enjoy all year long. Growing berries such as blackberries, blueberries and raspberries will make a wonderful addition to your kitchen garden. Raspberries not only taste good they are very beneficial to your health. Raspberries are one of a select number of foods considered to be a super-food; that is, they contain chemicals (phytochemicals) that science has learned help directly fight disease, including cancer. Raspberries are packed with nutritional value including high levels of folate, vitamin C, magnesium, manganese, and calcium. They also have the added health benefit of containing many anti-oxidant properties. * Summerbearing raspberries produce fruit one time in late summer or early fall. Red raspberries are the most common type of summerbearing raspberry. Red raspberries come in different varieties such as Latham, Prelude and Killarney. * Everbearing raspberries produce fruit twice a year: once in the springtime and once in the fall. Some common everbearing raspberries are Polana, Summit, and Golden. With good cultural practices and attention, some gardeners have had success getting certain everbearing varieties to produce fruit for many weeks. It takes two years after planting for the bush to produce fruit. The first year is vegetative growth only. If planted in a good location and well tended, raspberries can produce fruit for many years. Raspberry plants require full sun (at least 6 hours a day) and grow best in fertile sandy-loam soil with good drainage. Avoid planting raspberries in an area where water tends to pool as this will lead to an increased susceptibility to disease, root rot and poor fruit production. The ideal pH for raspberry plants is between 5.6-6.2. A soil analysis should be performed prior to any amendments. Raspberries should be planted in early spring after the threat of frost is gone. Red raspberries can be planted to form nice hedgerows as they mature. Each plant should be spaced about 2-3 feet apart and each row 10-12 feet apart. Black and purple raspberries do not become full enough to create a proper hedge and should be planted about 4 feet apart in rows that are 8-10 feet apart. Using the hill system for black and purple berries is a good option and the best use of space. Adequate spacing between plants is needed for weeding, fertilizing and pruning as well as aiding in proper air circulation and sunlight. Plant depth should be about the same as, or slightly deeper than, they were at the nursery. -Avoid planting raspberries within 300-600 feet of wild raspberries or blackberries; they can transmit viruses to your new plants. Additionally, you should not plant raspberries in the same area that potatoes, tomatoes, eggplants or strawberries have grown in the last 3-4 years as the soil may contain a fungal disease that causes Verticillium Wilt. Upon initial planting, you can apply a general fertilizer (10-10-10) at the rate of about one pound per 100 feet of row. Work the fertilizer into the soil with a tiller or spade. Another dose of fertilizer should be applied 2-3 weeks later. Organic matter such as manure or compost can also be applied. Side dressings or additional amendments should be used only after getting your soil results. Mulch can be applied to a depth of about 3-4 inches to cover. Do not put too much mulch down if the area tends to stay wet or retain moisture, as this will encourage fungal diseases. If you are planting one-year-old canes, you should cut the plant to about 6 inches above ground. Raspberries should receive about an inch of rain per week, either from rainfall or hand watering. * Aids in keeping the fruit healthy by increasing air circulation, keeping the fruit off the ground, and allowing access to full sun. This will increase your crop. * Makes pruning and weeding easier to manage. * Helps prevent certain diseases and pests. Trellises do not have to be overly complex. You can build your own or buy one partially assembled. To learn more about trellising and training raspberries visit this iowa state university website. Pruning plays a vital part in the health and crop production of raspberries. In order to properly prune your raspberries you will need to understand their two types of canes. The roots and crowns of raspberries are perennial, but their canes live only two years. Raspberry canes come in two varieties: primocanes and floricanes. Primocanes are first-year canes and floricanes are second-year canes that produce fruit. In the spring raspberries grow new canes from the buds on the crown of the shrub and underground. In the first season, these canes grow vegetatively only (floricanes). The first-year canes will overwinter and then produce fruit in their second year (as primocanes. ), and then the cycle begins again. Summer red raspberries should be pruned two times a year: once in late winter/early spring and again right after they have produced fruit (that you have harvested!). Raspberries come in a huge variety of cultivars. For an exhaustive list, visit this website. You will know your raspberries are mature and ready to harvest when they are easily separated from the core; if you have to pull hard to separate them they are not ready for picking. Raspberries will keep only for a few days to a week after harvesting. Place them on a paper towel no more than 3 berries deep and put them in the refrigerator as soon as possible. Do not rinse with water until you are ready to eat, as this will cause them to quickly mold. Raspberries are wonderful in jams and jellies and can be frozen and enjoyed all winter long. And, of course, for all your hard work, there’s nothing better than enjoying a handful of freshly picked raspberries. Blackberry plants are perennials, with roots that will last for many years. Blackberries are found in two different types of growth patterns: trailing or upright/erect. * Erect blackberries have stiff stems and can generally support themselves. They are also more cold-hardy than the trailing types. * Trailing blackberries, sometimes called dewberries, have canes that are not self-supporting and include: Marionberry, Boysenberry, Loganberry, Youngberry, and Thornless Evergreen. Trailing types of blackberries can be grown in colder climates if they are properly mulched and protected throughout the winter. Blackberry canes are biennial, which means they live for two years. When you first plant your blackberry it will not produce any fruit the first year. The first canes after planting are called primocanes, and they simply spend the first season growing. The second year’s growth, called floricanes, will produce fruit. After the floricanes produce fruit, they die, and a new cycle continues. * Primocanes are produced in the spring. Their growth habit is upright for a time then they turn downward and grow toward the ground. Be sure to keep these neatly out of the way for new primocane growth. * After harvest, remove the floricanes, and thin the primocanes leaving about a dozen of the sturdiest and healthiest ones for next seasons harvest. Blackberries prefer full sun (6-8 hours a day) but will tolerate some shade. Heavy shade will negatively impact the growth and fruit production of blackberries. Blackberries will grow in many soil types but well-drained soil is essential for a healthy plant. Waterlogged conditions will eventually cause root rot and plant death. If your soil is heavy, clay-like or compact, you can mix compost or well-rotted manure and sand into the soil. The ideal soil pH is between 5.5 and 7.0. If you are unsure of your soil conditions, you can have your soil tested at a local county extension office (go to this website to find the office nearest you). Blackberries are planted from rootstock and can be planted as early in the spring as you can work the ground. It is best to buy certified disease-free plants (instead of gifts from neighbors) to ensure you are planting healthy plants. When choosing a site to plant blackberries, you should avoid areas where peppers, eggplant, tomatoes, raspberries, (and blackberries) and strawberries were grown over the last few years. The reason for this is because these vegetables and fruits are susceptible to many of the same diseases as blackberries and can still be present in the soil. Before planting, prune out any damaged, dead or weak branches. Dig a shallow hole wide enough to accommodate the roots at their maximum width, cover the roots with soil at about the same depth they were growing at the nursery, and water well. If your soil test indicated it is low in fertility you can add fertilizer (5-10-5) at a rate of 1Lb per 100 square feet and work into the soil. Plant stems should be about 6 inches above ground level after planting; trim any that are overgrown. Trailing varieties can be planted from four to ten feet apart; erect varieties four to six feet apart. Rows should be eight to ten feet apart. Blackberries should be supported while growing. Much like raspberries, a trellis system works best. Erect varieties can be grown without support but will perform better and be easier to care for if grown on a trellis system. A trellis system does not need to be complex; cross-wires secured between posts are sufficient. There should be at least 4-6 feet of post above ground. Two wires should be used for support, one placed near the top of the post, and the other about 18 inches below that one. You may need to train your plants to grow on the wire by tying to them. If you are growing just a few plants, you can use stakes for supporting the blackberries. Fertilize your blackberries in the spring with a 10-20-20 fertilizer at a rate of about five to six pounds per 100 square feet. This should be applied in early spring when growth is just starting. Water the fertilizer in after the application. Blackberries should receive about an inch of water per week. Right after planting, your blackberries should be pruned to about 6 inches above ground, if they have not already come that way. After the floricanes have produced fruit the second year, they should be removed and the primocanes should be pruned for next year’s production. * In the summer, remove the top one to two inches of new primocanes as the plants become about 3 feet tall. * Remove the floricanes after harvesting the berries; these 2-year-old canes will die by the end of the growing season. * When plants are dormant in the winter, thin primocanes to three or four of the strongest canes per plant. If the plants are growing in a hedgerow, thin to one large cane about every 5 inches in the row. Prune lateral branches to 12 to 18 inches long. -Cheyenne. Early; berries very large, firm, attractive, good flavor; bushes vigorous, moderately thorny, hardy. -Shawnee. Midseason; long fruiting season; berries very large, shiny black, medium firm, good flavor; bushes vigorous, thorny, very productive. -Black Satin. Midseason, earlier than Hull; berries large, skin black, loses glossiness at maturity, good flavor; bushes semi-erect, thornless, hardy, vigorous. -Boysen. Midseason; berries very large, deep maroon, rather soft, excellent distinct flavor; canes thorny. -Chehalem. Midseason; berries small to medium, bright black, very firm, excellent flavor. -Chester. Late; berries medium, black, good flavor; canes thornless, semi-erect. Hull Thornless. Midseason to late; berries large, firm, good flavor and keeping quality; canes thornless, vigorous, productive; canes semi-erect, hardy. -Kotata. Midseason; berries large, glossy black, firm, good flavor; canes thorny, vigorous, productive. -Logan. Early; berries medium, long, dark red, soft, good flavor; thornless type available. -Marion. 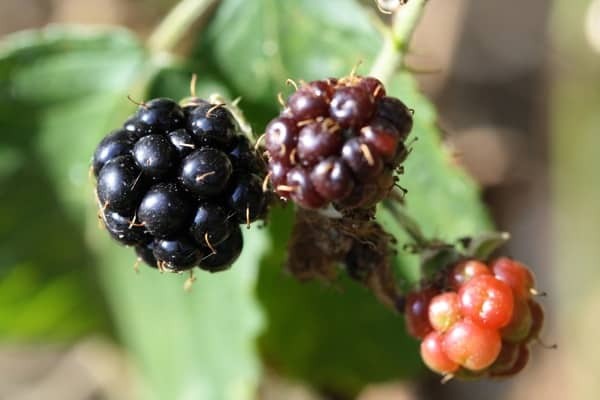 Midseason (early July to early August); berries large, bright black, medium firm, excellent flavor; plants produce fewer and longer canes than Boysenberry, thorny, productive. -Ollalie. Midseason; berries medium to large, bright black, firm, good shelf life; plants vigorous, productive, not hardy outside the coastal areas. -Silvan. Early to midseason; berries large, black, medium firm, excellent flavor; canes thorny, very productive. -Sunberry. Early; berries medium, dark red, poor to good flavor; canes thorny. -Tayberry. Early; berries large, medium red, soft, flavor distinctive, good; canes thorny. -Thornless Evergreen. Late (mid-August to mid-September); berries medium, dark black, firm, mild flavor; very productive; suckers from roots may be thorny. -Tummelberry. Early; berries medium to large, firm, poor to good flavor; canes thorny. -Waldo. Midseason (about 7 days later than Marion); berries medium, glossy black, firm, small drupelets, good, mild flavor; canes thornless, less vigorous than Marion (plant at 4 feet apart in the row), productive. -Young. Midseason; berries very large, dark red or maroon, very sweet, excellent flavor; superior to Logan for jam and freezing; canes are prone to winter injury in colder regions. Blueberries are delicious berries to grow in the home garden. They are often eaten freshly picked or used in jams, jellies, pies and pastries. The nutritional content of blueberries makes them one of the best foods you can eat. 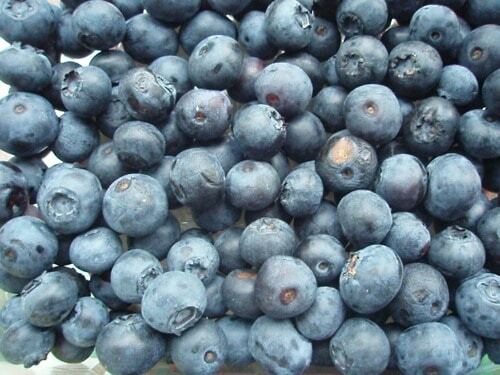 Blueberries are high in vitamin C, A, E, and Beta-carotene. They are high in fiber, low in sodium, fat and cholesterol. They are known as a “super-fruit” particularly because of their high levels of anti-oxidants, which has been shown to help prevent cancer. Most blueberries are very long-lived perennials. Proper soil preparation and upkeep will prolong the life and fruit production of the plant. Blueberries can be fairly easy to grow as long as the site has been properly prepared. Blueberries do require very specific soil conditions. Soil needs to be highly acidic at between 4.0 and 4.5, which is higher than most garden fruits. They also require well-drained soil that is rich in organic matter. Prior to preparing your soil for planting, you need to have a soil analysis done. This can be performed through your local county extension office. To find the office nearest you visit this website. Your soil should be tested twice; once prior to any amendments and again a few weeks after. Do not plant until your soil conditions are ideal for growing blackberries. Blueberries require full sun and consistently moist soil. They should get one to two inches of water per week, whether from rainfall or hand watering. When planting dig a hole about 18 inches deep and wide then add compost or peat moss and mix into the soil, then backfill until there is a hole about 4-5 inches deep. Space the plants about five feet apart, in rows that are ten feet apart. It is a good idea to put mulch down after planting; wood chips or sawdust work well. Water the new plants well. It is best not to apply fertilizer until you have had a soil analysis performed. As a general rule for blueberries, you can apply 1/2 to 2/3 pound of ammonia sulfate per 100 feet of row at planting. Depending on your soil conditions, you may need to re-apply in four weeks. The fertilizer should be placed about 4-6 inches around the plant, and not directly on it. In subsequent years, apply ammonia sulfate at a rate of about 1 to 1.5 pounds per 100 square feet. This application can be divided, with one at the time of bloom and another about 4 weeks later. This will help keep your plants healthy and productive. The root system of blueberries is very shallow and is sensitive to fluctuations in water supply. Blueberries need one to two inches of water per week. Mulching will help preserve moisture as well as keep weeds at bay. Place at least 2-4 inches of mulch around the plant and replenish when necessary. Blueberries do not need to be pruned the first few years in the ground. Removing the blossoms that appear in the first and second year of growth will encourage strong plants with good fruit production. During the fourth year your plants can be pruned while dormant (March is a good time of year in Midwestern and northern states). You should remove any dead, diseased or damaged wood. Wood that is weak or thin should also be removed. Any wood that is crossing over in the center of the plant should be pruned out. Remove all terminal buds. Prune so that the inner wood will receive some sunlight, as this will encourage good air circulation and overall fruit production. As your plants mature you can continue to prune any damaged, thin, crossing or overgrown stems. Blueberries do not produce nice large fruit if there are too many berries on the bush. For this reason it is important not to allow too many flower buds to remain. There are three main types of blueberries: highbush, rabbiteye, and southern highbush. * Highbush is a recommended variety for many Midwestern and northern states. Highbush blue berries do not require two different cultivars for successful cross-pollination. You will end up with larger berries and a higher yield, however, if you cross-pollinate. * Rabbiteye and southern highbush blueberries are recommended for the southern United States. Blueberries do not produce any fruit for the first three years. When berries begin to develop, you will need a system in place to prevent birds from eating all of your hard work! Netting over the top of the plant works well. Highbush berries take about a week after turning blue to fully ripen for harvesting. Rabbiteye blueberries are ready after about 10 days. To determine whether the blueberries are ready, place a container under the berry cluster and gently run your hand across the berries; the ones that freely fall are ripened. The berries that remain on the plant will need another day or two to fully ripen. You can check for ripened blueberries over the course of about a month. Rinse the berries under water and place on paper towels to dry. You can then cover the berries with plastic wrap and place in the refrigerator; they will last up to 10 days. Blueberries can also be frozen to eat year-round. Elderberries are an old-time favorite for use in jams, jellies and wine making. They are also popular as a landscape plant because of their attractive flowers. The flowers are also popular for use in drinks. Elderberries are a very hardy shrub plant (sometimes to zone 3! ), and make a nice hedgerow or screen. They have flowers that blossom in the late spring or early summer that are a pretty, lacy white that turn into gray/blue or purple-black berries in the early fall. Birds are very attracted to the berries in early fall (you will need netting if growing for consumption). Elderberries can grow to a height of 16 feet depending on the variety. Elderberries have good nutritional value and are high in potassium, phosphorus and vitamin C, a well-known anti-oxidant. 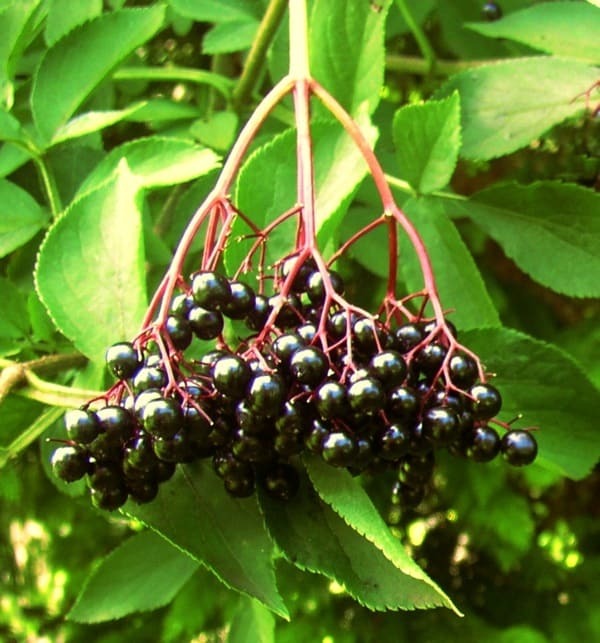 Elderberries grow best in full sun and well-drained, moist soil. They prefer a soil pH of 5.5 to 6.5 but are very forgiving of various soil conditions. Their root systems are very shallow and will need to grow in a place away from potential weed take-over. Elderberries grow from rootstock and should be planted in early spring, after the last frost date has past. Do not allow the plants to dry out before planting. Dig a hole that is about 3 times as wide as the root system and a couple of inches deeper. Plants should be spaced about 6-10 feet apart. The roots should not be planted too deeply in ground; spread about 2-3 inches under ground level and cover with soil. Water the plants well after planting. Elderberries are only partially self-fruitful, so plant two or more different plants to act as cross pollinators. Keep in mind the plants need to bloom around the same time. Adding manure or compost to the soil prior to planting is beneficial for overall plant health. A fertilizer of ammonia nitrate can also be applied at a rate of about 1-3 tablespoons per plant. Elderberries can be fertilized each spring with ammonia nitrate. Apply 1-2 tablespoons for young plants and up to 3-4 tablespoons for older, established plants. Elderberries have very shallow root systems and cultivation will need to be done very carefully so as not to disturb the plant. Weeding should be done by hand. Applying a 2-4 inch layer of mulch in the spring will keep weeds at bay. To keep birds from eating your berries you will need to place a lightweight netting over the berries when they begin to form. Elderberries send up a profusion of canes each year; these canes usually obtain full height in the same season. Lateral branches will form the next season. The flowers and fruit are produced on the current years growth, particularly on the lateral canes. Most fruit develops during the second and third years growth. Prune your elderberries while they are dormant (usually in March) and remove any dead, weak, small or diseased canes. All canes that are over three years old should also be removed. What should remain are a uniform amount of one, two and three year old canes. * ‘Adams No. 1′ and ‘Adams No. 2′ are two old cultivars, introduced by the New York State Agricultural Experiment Station in 1926. They are strong, vigorous, productive, hardy to Zone 4 and bear large fruit clusters. They also ripen late, with fruit maturing in early September. Other cultivars with large clusters and berries include ‘York’,’ Johns’,’ Kent’,’Nova’, and ‘Scotia’. ‘York’ is somewhat more productive than the Adams series, and the berries tend to be larger. Depending on the variety, Elderberries can be harvested in August through mid September. Remove the entire cluster of berries when ready to pick; the berries will easily fall off when ripe. For best flavor, use the fruit right away (they are not usually eaten fresh because of their bitter/tart flavor). If you are not using immediately, the berries should be put in a cool location for later use.